STOCKHOLM — At least 20 countries are expected to formally join the Paris Agreement on climate change this week, greatly improving the pact’s chances of coming into force just a year after it was negotiated in the French capital, U.N. officials say. That’s considered a blistering pace in the world of international diplomacy, reflecting a sense of urgency in the fight against global warming and a desire to seal the deal before the Obama administration leaves office. Brazil, Mexico, Argentina and Morocco are expected to hand over documents at the U.N. in New York on Wednesday to formally complete the ratification process. At least half a dozen small island nations including Papua New Guinea, Tonga and Kiribati will also follow suit. “We are ready. We will announce it in New York,” Moroccan Environment Minister Hakima el-Haite told The Associated Press. After years of negotiations, governments agreed in Paris last December to curb the emissions of carbon dioxide and other greenhouse gases that scientists say are warming the planet. More than 170 world leaders have signed the deal, but it won’t take effect until 55 countries accounting for at least 55 percent of global emissions have ratified or accepted it through their domestic procedures. That was initially expected to take several years, but 28 countries accounting for 39 percent of emissions are already done, including China and the United States, the world’s top two greenhouse gas emitters. U.S. diplomats are now pushing other countries to accelerate their ratification efforts so that the deal can enter into force this year. The White House says President Barack Obama and Secretary of State John Kerry plan to corner foreign leaders in the hallways during the U.N. gathering to personally pressure them to join this week. It’s possible that more than 55 countries will have joined by the end of Wednesday. It will likely take a bit longer to reach 55 percent of world emissions. Others say another factor is the potential of a shift in U.S. climate policy depending on the outcome of the presidential election in November. Democratic Party candidate Hillary Clinton has said the U.S. must implement the Paris Agreement, but Republican candidate Donald Trump has said he will cancel the deal. 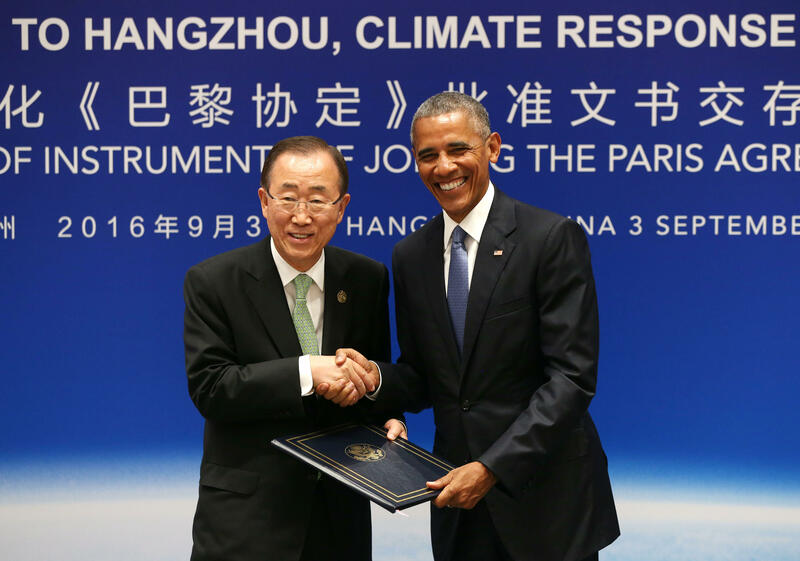 “The Obama administration clearly would like to see this done before they leave office,” said Alden Meyer, a veteran observer of the U.N. climate talks at the Union of Concerned Scientists. The Paris Agreement asks both rich and poor countries to take action to curb the rise in global temperatures that is melting glaciers, raising sea levels and shifting rainfall patterns across the globe. It requires governments to present national plans to reduce emissions, though the targets themselves aren’t internationally binding. The European Union, which considers itself as one of the architects of the Paris deal, is trying to fast-track its ratification process to avoid the embarrassment of sitting on the sidelines when it comes into force. The EU, which accounts for 12 percent of global emissions, originally planned to wait for its 28 member states to approve the deal domestically, but now wants to ratify it on their behalf. With or without the EU, there’s a chance that the deal can enter into force as early as the next U.N. climate conference, which starts Nov. 7 in Marrakech, Morocco. U.N. officials said last week that at least 20 countries had indicated they would join on Wednesday and that they were “absolutely certain” that the deal will come into force this year. For some the timing is mostly symbolic, because the first round of emissions targets doesn’t start until 2020. For others, like the island nations who face an existential risk from rising seas, it’s imperative that countries prepare to implement - and improve - their targets as soon as possible.